One of the main issues that we hear from people who use the services we offer at OUR Center is that they aren’t sure how they can be successful because it’s something they never learned. This is fair. After all, there wasn’t a class in high school that taught you solely how to find your passion and excel at it (although there really should be). In order to assist those who want to make more of their lives than what they are currently getting, we provide them career paths, as well as tools to use in their everyday life to better them in the future. 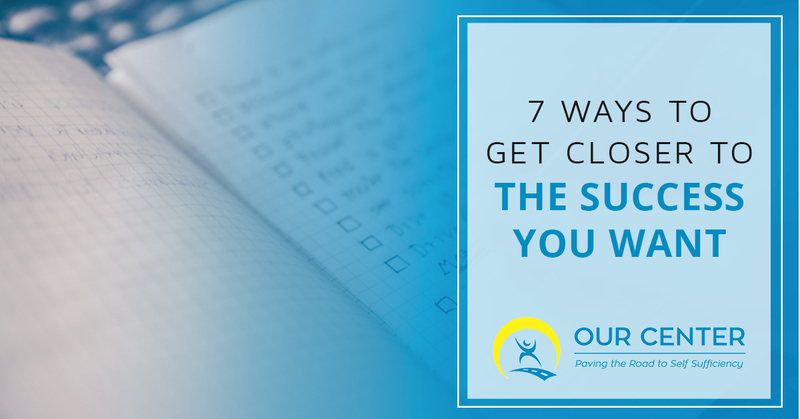 In this post, we are going to address seven ways in which you can move towards the future you always envisioned for yourself, but are not sure how to get to. Continue reading below to learn how to achieve your dreams. Finding your passion and your purpose is 100 percent a matter of heart. If you do not feel dedicated to what you are doing in the very depths of yourself, then why would you spend time and energy doing it? Keeping this in mind, when you ask you heart what it wants, what does it say back to you? Whatever your first instinct is, that’s probably a great place to start. The best way to know what your strengths are is to make a list of them, of course. Be honest with yourself. What are your skills and your experiences that have formed you into the person you are? Truly assess what you are good at and how you spend your time. Then, list your weaknesses. It’s great that you are good at so many things, but knowing what you are bad at gives you room to improve and grow. As nice as it would be if your dreams could just come to fruition as soon as you determine what they are, this isn’t going to happen. Give yourself time to make the plans that will lead you to your desired dreams or goals. Setting a deadline too close will often result in failure, making you feel as though you shouldn’t have tried in the first place. Don’t put yourself through feeling defeated when you don’t have to. Being able to see your goals in physical form on a daily basis is the best way to make sure you continually work towards achieving them. When you reach one of your goals, mark it off your list and add a new one. There’s something life-changing about always having something you are working towards. If you’ve heard it once, you’ve probably heard it a million times but making a vision board has proven to be a successful strategy for many people. While you may think this practice is corny, if it can get you to achieve what you want more than anything, isn’t it worth a try? When you see pictures of things you want every day, it trains your reticular activating system (RAS). This is the portion of your brain that decides what you focus on. A vision board can help you to stop focusing on the wrong things and start focusing on the right things. Whether you decide to make a tiny change to start working towards your goal or you choose to make a huge shift, choosing to do something that will get you closer to achieving your passion is where you have to start. Once you take that first step, the rest will have to be completed in order for you to achieve your vision. We’re going to tell you right now that things are not going to go the way you envision them in your head. Life happens and gets in the way of our plans all the time. The important part is to anticipate this and enjoy the ride anyway. Nothing is going to be perfect ever, but you can choose to make your vision flexible enough to where it makes you happy anyway.